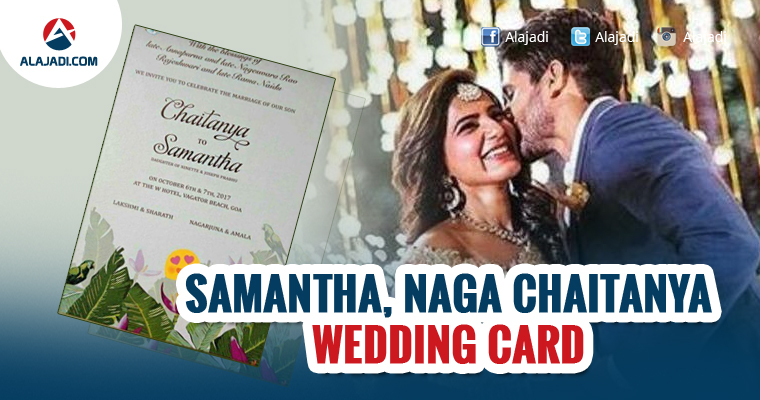 » Viral: Samantha and Naga Chaitanya Wedding Card! It is already a common knowledge that Samantha and Naga Chaitanya are in a relationship for many years. In January 2017, the couple got engaged and since then there are several rumors about their wedding date. However, now all the speculations regarding the wedding date and destination have came to an end. Young actors Naga Chaitanya and Samantha are all set for a grand wedding that will take place on October 6th and 7th in Goa. The wedding will take place according to both the traditions of Hindu and Christian culture. 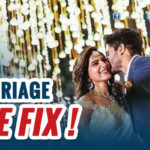 Chaitu and Samantha are busy with the wedding preparations and the wedding card of the duo has been making rounds across the social media circles. The card starts with the blessings of Chaitu’s grandparents, Akkineni Nageswara Rao – Annapurna and Daggubati Ramanaidu – Rajeshwari. The wedding is said to take place in the lavish W Hotel located in Vagator, Goa. The most interesting thing is that Chaitu’s mother Lakshmi along with her step father Sharat’s names have been mentioned along with Nagarjuna and Amala. The card looks completely simple and there are talks that the card is completely fake and is designed by fans. Chaitu and Samantha are busy wrapping up their films and will take a long holiday after their wedding. On the work front, Samantha is busy shooting for Ram Charan-Sukumar film Rangasthalam, Vijay61 & Mahanati movies. Chaithu is busy shooting for Yudham Saranam. Social media says Akkineni and Daggubati family members are in the process of sending the invitations to close friends and family. Matter of interest is, is this card really original or fake?